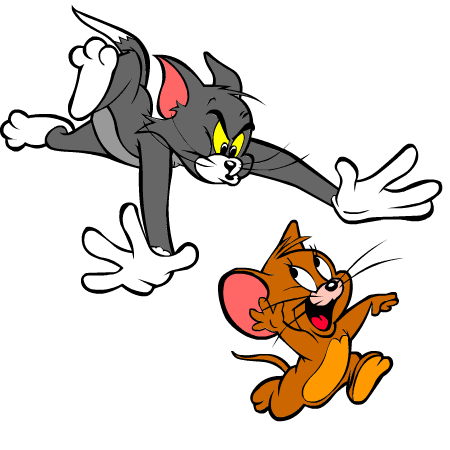 I recently downloaded Tom and Jerry series and it just makes me so nostalgic! I loved T&J for sure :) Used to watch it often. But my favorite will have to be Captain Planet. it's a shame they cancelled that. Could've been a lovely way to put the idea of conservation and nature into kids' minds. I love Mr Bean, not the cartoon one. Tom and Jerry also i enjoy sometimes, but not often. I still love Tom & Jerry. Of course, now I'm 'forced' ...no wait...coerced into watching whatever it is that tickles my son's 'comic buds'. I just love Cartoons. That is why S and I don't have any trouble during TV time. Tom and Jerry is amongst my favourites, Mickey and some others. Pooja, I have most of the classic episodes in CDs. Haven't watched them for almost 2 years now. Must dig out those CDs on one of my weekly offs soon. Vinay, you're the second person who has favorited Captain America. I have never watched it. I don't like educational cartoons. I just like weird, funny stuff. Ok Alok, I haven't seen Mr. Bean as cartoon yet. What does your kid like to watch, Sid? Doremon? Hahaha! Tom & Jerry are cool, aren't they. No matter how old you get, you still enjoy watching them. I'll come back when I remember the rest. The rest? You mean there are any left ??? Yeah it's so annoying, couldn't remember some of their titles. Mind you, these are just the ones I liked. There were a bunch of others I hated which obviously I haven't mentioned. Anyway, which ones from my list have you seen? Very few from your list. Mostly the Disney ones... Duck Tales, Bugs Bunny etc... and Spiderman of course. Rasna Spiderman, I mean. Sone of these, I have seen as movie adaptations only, like The Addams Family. A few days ago, one of my kiddie-customers gave me two movies of Donald Duck and Chip & Dale episodes. So I was watching one of them yesterday. What nice customers you have, didi-auntie. Arre haan, Chip n Dale, Rescue Rangers. Surprised to hear kids still follow these tools. I thought it was all that Ikamon Pikamon rubbish. He gave me The Croods and some Sinbad movie also. Animation of any kind was rare man. The only cartoon I knew was one 15 min segment on Saturday evening on Doordarshan. Then came Mowgli on DD Metro, followed by Duck Tales and Talespin a year later. Then came Cartoon Network, 1996? That too not 24 hrs. It used to switch to TNT at 9 PM. Animation of any kind is cool. Have you seen Hotel Transylvania? It was on TV some time ago. I quite liked it. Now waiting for its part 2 to be available on yify-torrents. No, I haven't seen Hotel Transylvania. It's been a while since I've watched an animated movie actually. Except for The Animatrix, which is a collection of 8-9 short animated films based on The Matrix. Brilliant animation, made for adults, very nerdy. What do you mean 'Yify'. In the Torrent Bible, he's called Saint Yify. For bringing to the mortal world Godlike resolutions in human filesizes. Oh. I never quite understood The Matrix. I suppose The Animatrix would be equally complicated. Hotel T is for kids. It's about Dracula and his daughter. It's got good music. "Saint Yify" had to take part 2 off his website, I think. I see the post there for part 2, but the torrent file is missing. Hotel T is in my mammoth IMDB watchlist now. Yify is gone for good, they say. So WYSIWYG I guess. I'm still hoping s/he will surface someday with another obscure TLD. Inshallah. My favorite Tom and Jerry episodes involved fireworks and that big bulldog Butch. Gone for good? Surely the future cannot be that bleak! My fav T&J episodes were the non-wordy ones... all action and no dialogues. Ha ha, ever the action fan you are.